Slow Cooker Ribs are the perfect summer food, but I make these ribs alllll year long since they are cooked in a crockpot! 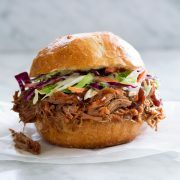 No smoker or grill required here. And guess what? This version is even better. These ribs are unbelievably tender. We’ve had bad ribs that you have to chew of the bone and that are unfavorably tough. These are anything but. The meat falls right off the bone and melts in your mouth! Another thing I really love about this recipe is this homemade bbq sauce. It’s flavored just how I like. It’s lightly sweet and tangy, it’s rich and has good depth, and it’s slightly smokey with a little kick. The other great thing is that there will be extra sauce so you can grill chicken the next day and slather it with lots of this bbq sauce. When in a rush you can use some of your favorite bottled barbecue sauce but I highly highly recommend trying this homemade sauce when you’ve got the time. It’s so easy to throw together it’s just a bit of measuring and simmering. First you’ll remove that thin whitish, somewhat translucent membrane from the back of the ribs. Here’s a video if you’ve never done it. Then you’ll rinse and dry the ribs and rub a spice rub over them. After that you’ll pour a little water into the slow cooker and add the ribs. If the bones aren’t too wide to wrap the ribs around the inside of the slow cooker and still be able to cover with a lid then do that, otherwise cut the in half and layer one over the other as I had to here. Cover and cook until very tender about 6 1/2 – 7 hours. Meanwhile prepare the sauce by mixing bbq sauce ingredients in a saucepan and simmering 15 minutes to reduce and thicken slightly (chill if ribs won’t be done for a few hours). Remove ribs from slow cooker once cooked, carefully transfer to a wire rack over a rimmed sheet (covered with foil if you hate clean up). Broil on each side about 2 – 3 minutes to slightly caramelize and brown the sauce, serve warm! You can adjust the cooking time here based on how tender you like ribs. I like them fall off the bone tender so I cook about 6 1/2 to 7 hours, but if you want the meat to stick the the bones it will probably be more like 5 hours. And those times are just an estimation because every slow cooker cooks a little differently, especially older models. After you’ve tried the first batch then you’ll know exactly what time works perfect for you and just jot that down. 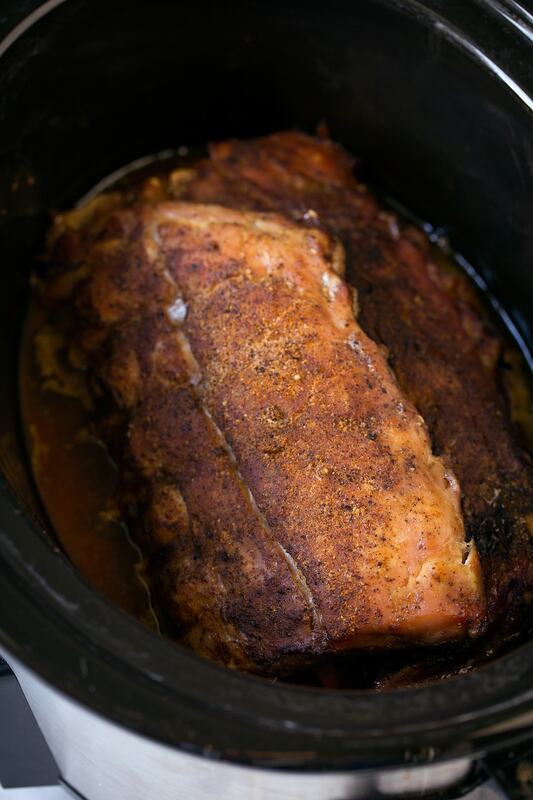 I make these slow cooker pork ribs usually once a month, and once you try them you’ll know why. Everyone in my family loves them and requests that I make them. I don’t know if meat gets any more tender than this! Can I Cook These Ribs on High for a Shorter Amount of Time? Having not tried it myself, I can’t say for sure. But I prefer to cook ribs low and slow to make them super tender. If you have time, cook them on low as the recipe instructs for best results. Can I Freeze Leftover Barbecue Sauce? Yes, you should be able to freeze the leftover homemade barbecue sauce (you’ll have about a cup left over after making the slow cooker ribs). 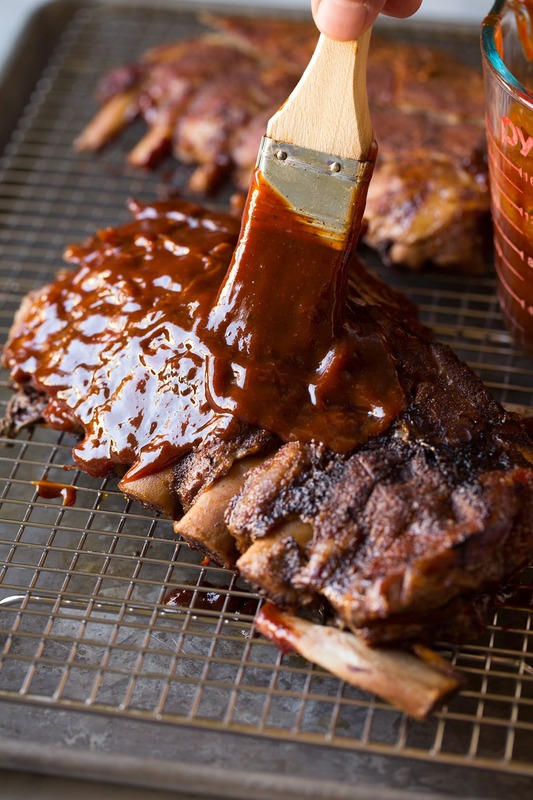 This barbecue sauce is super versatile and can be used on any meat! 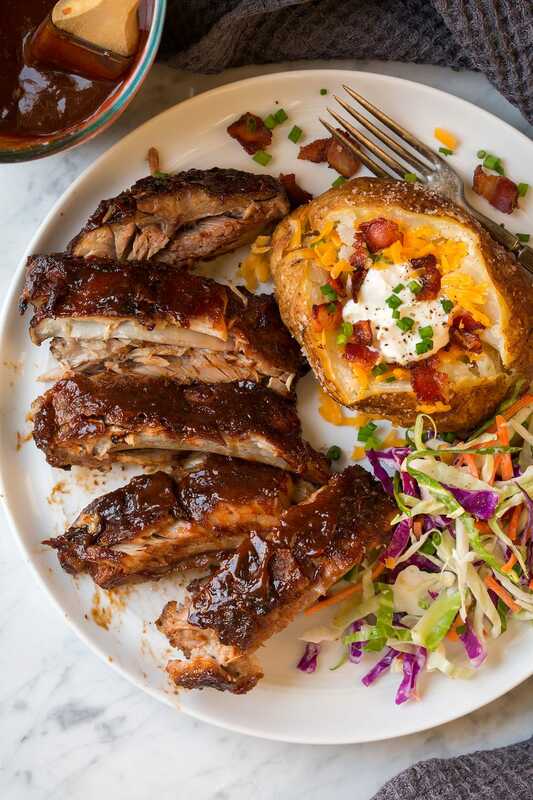 Use baby back ribs, they’ll fit in the slow cooker much better. They’re more tender than spareribs too. Adjust heat level. 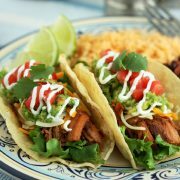 Add more or less chipotle chili powder to the barbecue sauce to suit your tastes. It’s spicy stuff, so use your best judgment. Don’t leave out the hickory smoke flavor. You can find the liquid hickory smoke flavor in the barbecue section of your local grocery store. It mimics that classic smoked flavor. Cook low and slow. High heat cooking won’t work here. Transfer the slow cooker pork ribs to a wire rack using tongs; they’re very tender so you’ll need to be careful! 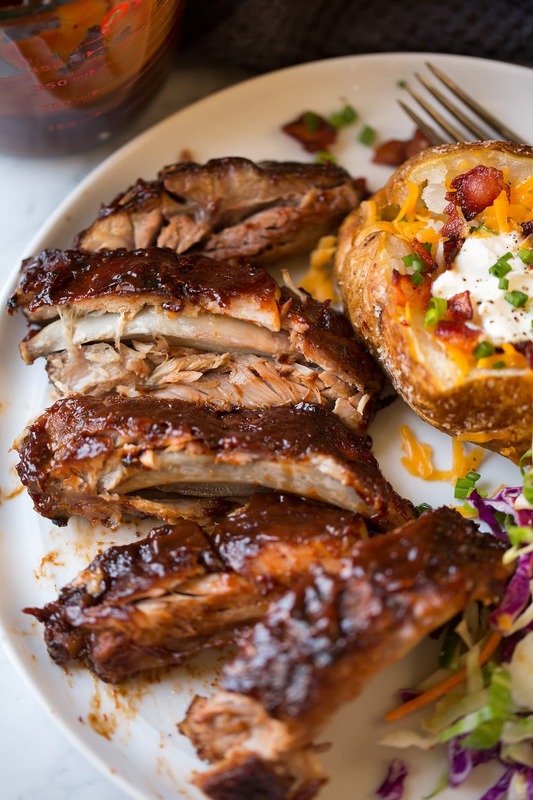 This is my favorite ribs recipe, they are melt-in-your-mouth tender and amazingly flavorful! Everyone will love that homemade sauce and you'll love how easy these are to make. When you are short on time a store-bought bbq sauce will work here as well. Remove then membrane layer from back of the ribs, then if the ribs are too wide to fit sideways along insert of slow cooker then cut ribs in half. Rinse and dab dry then sprinkle and rub both sides of each portion with spice mixture. Pour 1/2 cup water into a 6-quart slow cooker. Place ribs over water (one layered over the other if you had to cut in half, otherwise curl around inside of slow cooker insert). Cover and cook on low heat 6 1/2 - 7 hours or until very tender. Place a wire rack over a rimmed baking sheet lined with aluminium foil. Carefully transfer ribs with curved side up to wire rack on baking sheet (I recommend using two pair of tongs or tongs and a turner to lift them, they are super tender). Brush with about 1/2 cup bbq sauce (total). Move oven rack 2 levels below broiler and heat broiler. Broil ribs until bbq sauce starts to set and caramelize, about 2 - 3 minutes (keep a close eye on them). Remove from oven, carefully turn ribs brush with another 1/2 cup sauce and return to oven and broil about 2 - 3 minutes. Serve warm. In a large saucepan combine all bbq sauce ingredients along 1/2 cup water and season with salt and pepper to taste. Bring to a light boil then reduce heat to low and simmer 15 minutes, stirring occasionally. Let cool (not that you'll have about 1 cup extra sauce for another use). 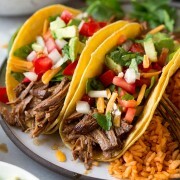 Add more or less chipotle chili powder to the barbecue sauce to suit your tastes. It's spicy stuff, so use your best judgment. 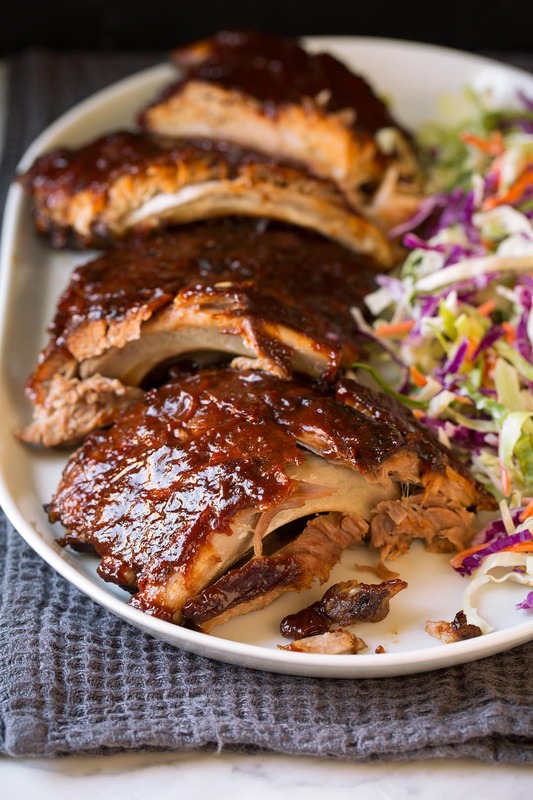 ginny Fabianski: I am making these ribs today. I have 8 pounds of ribs as I am feeding a crowd. Can i place in crockpot (they fit) on high for 6 hours. I was hoping to then transfer to oven to cook on low if they are not cooked all the way through.